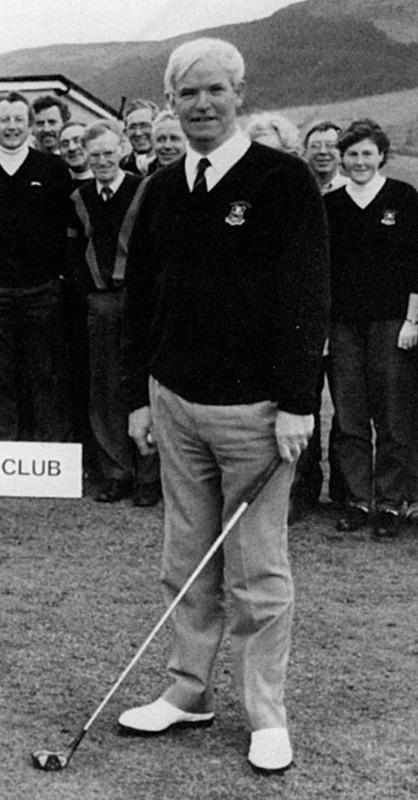 On the ball: Dan O’Neill, captain of Strandhill Golf Club March 1990. In early summer 1954 one of Dan (Danno ) O’Neill’s first jobs, as a 25-year-old Garda, was to go to Scotland and bring home a man accused of deserting his wife. Dan was stationed at Drogheda at the time. A local woman had made a complaint that her husband, a successful building contractor, had deserted her and her children. She wanted him back. She gave the gardai a photograph of a fine looking man ‘dressed in a double-breasted fawn crombie belted overcoat, with a long white scarf flowing across his shoulders.’ After a period of time the man was apprehended by the Scottish CID, and was awaiting collection in Edinburgh. With Garda Hugh Shreenan, a native of Ballymote, Co Sligo, the two young men crossed the Irish Sea to collect their man. But when the prisoner emerged from his cell the two young gardai got a shock. Instead of the prosperous, and healthy man they saw in the photograph, they were confronted by a thin, wasted looking fellow in his early 40s, ‘who looked wretched, and wore a long greasy overcoat and turned-down Wellington boots, which were well worn. His hair was in a terrible condition and he wore a beard. Furthermore he smelt’. Danno announced that he was arresting him for ‘Wife Desertion’, and taking him back to Drogheda. The man made no reply. When Dan produced the handcuffs, the man spoke for the first time: “Put these irons away, sonny.” Dan and Hugh looked at each other and realised that their prisoner was no condition to cause trouble. They returned to Dublin that evening, giving time for both guards to see that their prisoner as probably a decent man, who had got himself into trouble, and that maybe with a bit of help he might come through this crisis in such a way that everyone would be satisfied. Having spent a night in Dublin, the following day they took the early train to Drogheda to be in time for the District Court under the humane Judge Alfie Rochford. This time the man who sat between the two guards looked very different from the man they had arrested. One guard had given him a good pair of shoes, Hugh had supplied a new shirt, tie and a pair of socks. After he had a bite of breakfast he walked the short distance to the courthouse in Fair Street, looking a million dollars!’ There was a brief reunion with his wife and children before he stood in the dock. The judge asked him if he had anything to say. The man replied very clearly that he now realised that he had made a mistake, and was sorry. He asked the judge to give him one chance. He wanted to return to England, and make a fresh start. He promised that within six months he would come back to Drogheda, and make things up to his family. The court fell silent. Everyone looked at the judge. The judge looked at everyone in the court. He agreed to give him that chance. Furthermore, the judge asked him if he had any money? Upon being told “Not a penny” the judge suggested that a collection be taken up from the court to buy the man a ticket to England. This was gladly done. Nearly four years later, just before Christmas, Dan was walking down West Street carrying his two-year-old son in his arms. As he was passing Woolworths, the very same man stepped out of a car. He looked prosperous and well. He was very excited telling Dan how he had managed to get his life and work back on track. He was reunited with his wife and family, and he was so grateful for the help the gardai gave him. He insisted on shoving a £5 note into the baby’s pocket before getting back into the car, and driving off. This is one of many stories in Dan O’Neill’s book Divided Loyalities* which I mentioned last week. Dan enjoyed a number of careers before he became one of the faces of Galway tourism during the 1970s and 80s. Understandably, because of his football skills there is a lot of GAA in his story. The book takes its title from an unusual misunderstanding that led this fiercely proud Mayoman to quit playing for his home county, only to win a thrilling All Ireland final against Cork in 1957, playing in the red and white colours of Louth. Danno was born in Castlebar in 1932, and as a young lad played his way up through the Mayo teams in Mc Hale Park with the famous Mitchels to national league status. Despite being a very promising player, he didn’t have it all his own way. In the 1954 Connacht Championship Mayo, fresh from a victory over Roscommon, looked forward to thrashing ‘the old enemy’ Galway in Tuam. The only man they feared on the Galway team was the legendary Sean Purcell. When they heard that Purcell would be playing at full-back, the Mayos scoffed at such a decision. They believed that position would keep Purcell out of the main action, and that victory was theirs. But we all know now that Purcell was Galway’s secret weapon for years, and could play in any position. Danno says the experience was a ‘nightmare’. As a young garda, stationed in Drogheda, Dan had no trouble travelling home at weekends to play. However, following a row over expenses, the hot headed Dan felt undervalued and declared for Louth. It caused surprise and controversy at the time, but it was to have its compensations. Louth is affectionally know as the ‘Wee County’ as it is the smallest of Ireland’s 32 counties. But in 1957 it punched way above its size, beating confident Cork 1.9 to 1.7 to win that year’s All Ireland. It was a great moment, and Danno played a leading role. But after an absence of nine years, all was forgiven, and he was back on the senior Mayo team. He eventually became chairman of the Mitchels. When he came to work in Galway in 1967, he played for a while with Fr Griffins. I have always believed that the decency of the GAA is reflected in the man. All this was good training for Dan’s work in Ireland West, where as promotions officer and assistant regional manager, the region attracted record numbers of visitors year after year. At no time was this training put to a better test than during a busy promotion of coarse angling in the west of Ireland in February 1972. That very afternoon, following the shooting dead of 14 people the previous Sunday in Derry, the British embassy in Dublin was burnt to the ground. Irish Tourism had focused on the fact that there were more than four million coarse anglers in the British midlands. Could some of these be tempted to come to Ireland? A major campaign was launched in Manchester, Wigan, Bolton, Bury, Birmingham and Coventry areas. Fishing clubs were contacted, venues were booked, a free drink was promised to all who showed up. On the night of February 2, 300 anglers crowded into a club for Danno’s presentation. All afternoon the rioting around the Dublin embassy was dramatically carried on all the news bulletins. Effigies of the British prime minister Edward Heath, and the northern Ireland PM Brian Faulkner, were burned. The Galway men were shaken by the news. Surely no one would turn up. They wondered if they should just cancel the whole thing, and make a dash for home. They decided to stay. And much to their surprise they had a full house that night and every night. Next week: I’ll get to the Mayos in Galway. It is believed that Danno led the coup d’etat, an attempted take over by the Mayos, but it hasn’t succeeded. * Divided Loyalties, published by Low Ball 2008, on sale €15.